Regain your full capabilities for health and life at Standing Tall Chiropractic. All ages are welcome, from newborns to seniors. We’ll guide you on your journey to reaching your goals, assisting you each step of the way. Contact our team today to get started! You’ve found it: Standing Tall Chiropractic is exactly what you’ve been searching and hoping for — a warm, upbeat, fun place to discover your full capabilities. Glendale Chiropractor Dr. Dale Ellwein knows that you have a spark inside of you that’s just waiting to be expressed. When your nerve system runs free and clear from any interference, you can live out your life’s purpose, feel fulfilled and transform your entire existence. Your nervous system is responsible for how you experience life. When your spine isn’t working, it results in a disruption to this master control system. We love having people seek our help who have tried other avenues and can’t understand why they haven’t gotten results. Using just his hands, Dr. Dale will turn the power back on in your body so you can feel better, function better and get more out of each day you’re given. Even those who have had chiropractic care in the past will have a completely unique experience at Standing Tall Chiropractic. 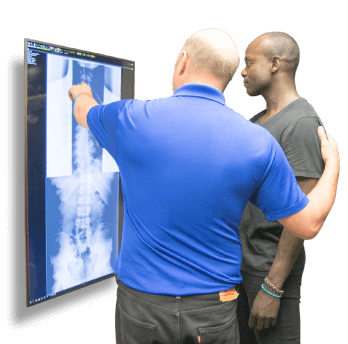 When you begin care with our knowledgeable, skilled team, we’ll give you an extremely thorough evaluation that includes digital X-rays motion studies. By taking this comprehensive look at your health, we can create a plan to help you reach your goals. Every appointment you have with us will be custom-designed to what you need on that particular day. Dr. Dale’s techniques are precise and tailored to your comfort level. Manual and instrument-based methods are available, enabling him to adjust anyone, from newborns to senior citizens with osteoporosis to world-class bodybuilders. You’ll be given regular re-examinations with objective measurements taken so that you not only feel your progress but can see it, too. Contact us today to book your time with Dr. Dale, chiropractor Glendale! We offer a $47 new patient special that includes the initial examination and any needed X-rays. Additionally, PPO insurance plans can be used for your visits. Dr. Dale provided me the most knowledgable, life-changing experience a chiropractor could provide.